June 10 was Luna’s Gotcha Day. For many years, it was one of the most joyous days of the calendar. Since her passing in 2016, it has been challenging and melancholy. There is rarely a day when I don’t think about my special little girl and soulmate of almost 12 years. Grief is a nonlinear process. The memories of her life, and of her loss, have mostly been integrated. I can casually see pictures on a regular basis of her and remain in the moment, but scrolling back through them in a deliberate process this morning brings some tears. CatSynth HQ is very much Sam Sam’s now, and we respect her territory (and spoil her rotten while doing so). Yet even she sometimes seems to sense a presence of a former kitty in some of the corners and crevices that defy cleaning. There is so much I miss about Luna. Her beauty and elegance, her shy but sweet nature. And she was fiercely territorial, especially when it came to me. She did not like to share, but she made me feel very loved. She could sit patiently while I made weird sounds in the studio. And despite being a “strictly indoor” cat, she loved going outside on the patio after we moved to San Francisco. Regular readers know I am not at all religious. And I don’t have a particular notion of an afterlife. But I do like to sometimes think about Luna taking her place among those I have lost over the years, mostly human friends and family. The visualization is of them all standing and waiting patiently, a little black cat in front of the much taller people. I also take comfort in the Rainbow Bridge, and in the community of cat bloggers who have loved and lost over these many years. I do not expect that the grief will ever disappear entirely. And that’s ok. We continue. I don’t have many memorable dreams these days. But when I do, they usually occur in the late morning hours – far past what many people would consider a reasonable time to wake up – and they are more often than not rather tense and stressful. This morning was no exception. The majority of the dream took place at Westorchard Elementary School in Chappaqua, New York. This is my elementary school where I spend many of my early years. But I was my 2017 self, a grown professional woman. I had some sort of teaching gig there, though not a full-time one with a fixed classroom. I have no idea what I taught. The students were mostly absent from the dream, except as occasional props in other teachers’ classrooms, visible behind glass walls (the real-life school did not have glass walls in classrooms). I was mostly wandering around the Byzantine hallways between the different modernist wings of the school (that part is accurate), But in the dream there was an even larger labyrinth of utilitarian hallways, lounges, fitness centers, and conference rooms, that were exclusively for staff that as far as I know did not exist in real life. During the course of the dream, I seemed to randomly shuttle back and forth to New York City at all sorts off times of the day, with lots of moments on subways, buses, and in impossible buildings. It also seemed like I would camp late nights at the school, with a bag of clothing and other living stuff in my small office. And there were cats. Lots of cats. Most notably, Luna was part of the dream. Sam Sam was known, but not present. Indeed, the main action of the dream, and what made it so stressful, was the fact that seemed to be constantly bringing Luna with me to school, and she kept getting lost. So much of the time wandering the real and fictitious halls of the school were spent trying frantically to find a small black cat. A task that was made harder by the fact that there seemed to be many cats wandering around. I scooped up one cream colored cat, made friends, and then proceeded to lose her as well. I would sometimes espy a brown or black cat, only to conclude that it wasn’t Luna, and then a few moments later see the purple collar and pink pendant, turn her around and look into her emerald eyes. I’d grab her squirming body, give her a big hug, and then a few minutes later proceed to lose her again. I sometimes got distracted by the architecture in New York – one long detour in the city had me scrambling to find an elevator from the top floor – and some of the apparent remodeling in the school. One floor between two classrooms in Wings D and E was removed to make an open double-story loft-like space. One auxiliary staircase was at first dark and with vinyl flooring from the actual school but later was brightly lit with white marble stairs. I think this was the moment I figured out this was a dream, and it didn’t last much longer than that. But not before one more frantic moment locating Luna, grabbing her and shouting out to my colleagues for a bag. I am not one for broad metaphors, but I do like to oversee and analyze the details of things, and this dream has a lot to unpack. It was beautiful even while it was anxious – in that way, it was like many films that I enjoy. Luna’s presence is the easiest to assess. I have had several such dreams about her over the years, some before her cancer diagnosis. The earlier ones were fear and anxiety of loss – that was a part of this dream as well – but now there is also unprocessed grief. As for the many other cats…well, I do love cats. The school setting is interesting. It’s not unusual for past schools to appear in dreams. But this one was unique, in that was returning as a teacher. Most often, I am an adult, but for some reason having to go back and repeat a grade (usually some bureaucratic technicality). Those dreams were usually humiliating. This time there wasn’t any such humiliation, and my interactions were with the teachers and staff as peers. Also, I was my 2017 self, as opposed to a very different past self as a younger adult that almost always appeared in such dreams. It’s quite a relief to be myself in the dream, even if it was a weird and stressful one. Why Westorchard in particular? That’s hard to say, though I know I have looked at it on Google Maps several times of late. The architecture and layout of that school were quite interesting. It was a daily exposure to a particular type of modernism. Architecture and space are an important part of my dreams, as they are in waking life. The dream architecture can be impossible at times and transcend space. And New York just looms large in my life. It’s been a year since Luna passed away. And so today we mark her yahrzeit, or anniversary of death. Over the past year, the grieving process has continued in its complicated and chaotic pattern, sometimes raw and at the surface, sometimes just a fond memory now tinged with melancholy. Perhaps if one plots the grief over the course of a year. it will trend downwards, but that doesn’t mean there aren’t moments of deep loss and sadness. We began observing the yahrzeit at sundown yesterday. After repeated heatwaves and the worst fires and air quality that I have experienced in California, the skies and air suddenly became chilly, crisp, and damp, signaling the real arrival of autumn. The palpable chill in the air brought memories of Luna’s last week back into focus and set the tone for the evening. We switched on the memorial candle – I only use electrical candles for this purpose. A glass or two of red wine, some comfort food, and David Bowie on the stereo. The songs “Dollar Days” from Blackstar and “Prettiest Star” from Alladin Sane are particularly tied to Luna’s passing, along with the chill. 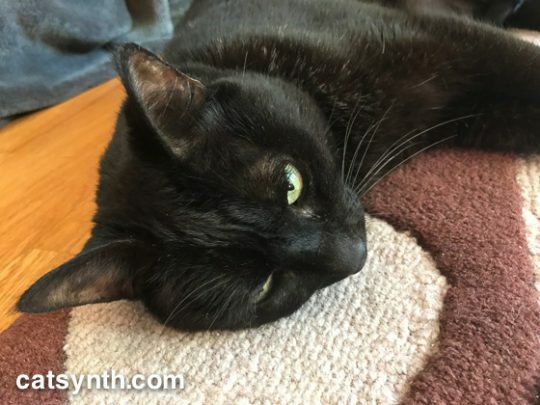 Sam Sam seemed to sense my state – exacerbated by an unusually stressful workday on top of everything else – and provided a lot of extra comfort last night, breaking her night-time wanderings around HQ to come and lay on my chest and purr. She does this most days, but not as long or as deep. Indeed, her presence has been a great source of love and comfort as I continue to move forward. I will always miss Luna, but my current and future cats need me in the present. Today I brought Luna home, on what would have been her official 12th birthday. She has a place of honor on one of our most prominent shelves, with her remains as part of a shrine. Her ashes are in the wooden box in the center. It has a picture frame, which I still have to fill. 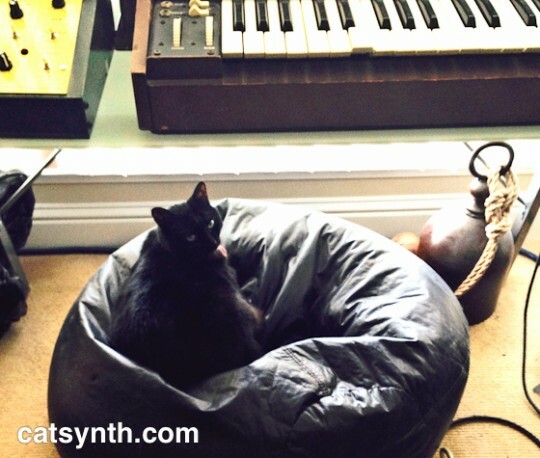 There were over 500 photos of Luna posted on CatSynth, and many more in my archives. It will take some time. To the right is her paw print, part of the normal custom from cremation of a beloved pet. And the small vial contains a bit of her beautiful fur that I saved from when she was alive. She has good company, with her shrine between some of our prized feline objects: a large maneki neko from Tokyo and a cat silk painting from Suzhou in China. To say this is emotional is an understatement. But I hope I continue to do my best by her remains and her memory. Included with Luna’s remains was a lovely printed copy of the story of the Rainbow Bridge. As the Mourners’ Kaddish is to Jews, the story of the Rainbow Bridge is to animal lovers of all heritages. There are variations, but we reproduce this poetic version below. Is a place where each beloved creature finds a rest. The sadness they felt while they were apart. We were helped through Luna’s end-of-life process by the wonderful people Golden Gate Home Hospice and Euthanasia. I found myself heading to their office yesterday to pick up Luna’s remains. They are located in the western part of San Francisco that includes the Sunset and Richmond districts. We often refer to them collectively as “The Avenues.” It’s a part of the city I rarely find myself in these days (although Luna’s general-practice vets were out there as well) but it long captivated me, even before I moved to the city. It was a dreary, rainy day as I made my way towards the ocean on 19th Avenue, Lincoln Avenue, Sunset Boulevard and then Irving Street. Within sight of the water I stopped at bodega for some needed sustenance. The walls displayed pride in their Sunset neighborhood. The rain turned from a light drizzle to a heavy downpour as I left the bodega and headed to the Great Highway. I turned into Golden Gate Park by that bizarre windmill that symbolizes the western edge of the city. In the rain, the park was quiet and a deep green. I headed out of the park north on 25th Avenue towards Geary Boulevard in the Richmond and my final destination. The Russian heritage in the immediate neighborhood was unmistakable, from the large Orthodox church to the storefronts. In the office, I was treated warmly and kindly, as any bereaved person should be. But right after picking up Luna’s box, a cat came out from the back of the office and created me enthusiastically, even chatting a bit. I was informed that she doesn’t give this treatment to everyone – knowing cats as well as I do, I don’t doubt that at all. In what was a dark and emotional time, it was a moment of delight to be once again in the presence of a cat. It is through tears and with the heaviest of hearts that we say goodbye to our beloved Luna. She passed away quietly and peacefully this afternoon. Since suspending treatment, I have endeavored to keep her happy and comfortable and surrounded by love. The cancer continued to spread and over the past week it was clear just how much pain and difficulty she was in. It was my last gift to her to let her go and be free of the pain. Knowing that, it hasn’t made it any easier to say goodbye. Luna and I were an inseparable team for over 11 years, years filled with love and fun and adventures. Over time, we became very in tune to each other’s emotions and needs, and have given one another strength and comfort through many challenges and crises. Indeed, she would always be able to instantly when I was sad or in pain, and come over to sit on my chest and provide comforting and healing purrs. This time she isn’t here to do that. Fortunately, I have friends and family, and this wonderful community around CatSynth to draw on. Thank you all for wonderful support you have given during the past year and a half, and beyond. I am still processing what happened today, and only beginning the grieving process. I will have much more to say over the course of this coming week and in the weeks after that. For now, I leave you some music that speaks to this moment (including the track from Blackstar that we shared on Friday), as well as a modified Mourner’s Kaddish that I will be using, with both Hebrew transliteration and English translation. ba-a-ga-lah u-viz-man kareev, v’imru oh-meyn. Y’hay sh’may ra-ba m’va-rach l’olam ool-ol-may ol-may-yah. in the world you created according to your will. forever, and ever and ever. May there be abundant peace from heaven, and life, for us and for all G-d’s creation; and say, Amen. May G-d who creates peace in the celestial heights, create peace for us and for all creation; and say, Amen.